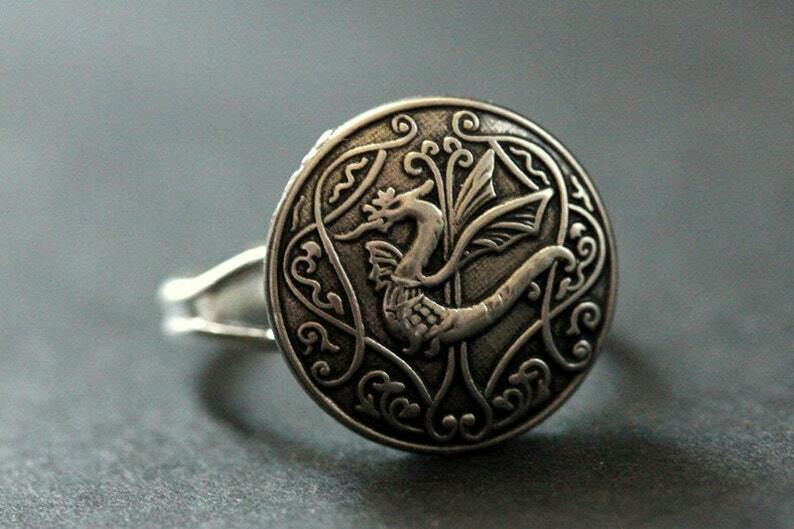 Celtic Dragon Ring. Celtic Knot Button Ring. Silver Button Ring. Adjustable Ring. Handmade Jewelry. Celtic Dragon Ring. Celtic Knot Button Ring. Silver Button Ring. A detailed metal button with unique Celtic knot dragon design has been re-purposed in this handmade ring by being set upon a silver plated ring base that's adjustable from size 6 and up in this handmade ring. If you would like to order a larger quantity than what's offered in this listing, please contact me for availability. Celtic Seahorse Ring. Celtic Knot Silver Button Ring. Horse Button Ring. Adjustable Ring. Handmade Jewelry. Copper Celtic Knot Ring. Button Ring. Copper Ring. Adjustable Ring. Handmade Ring. Costume Jewelry. Handmade Jewelry. Acorn Ring. Acorn Button Ring. Silver Button Ring. Adjustable Ring. Silver RIng. Handmade Ring. Acorn Jewelry. Handmade Jewelry. Claddagh Ring. Claddagh Button Ring. Silver Button Ring. Adjustable Ring. Silver RIng. Handmade Ring. Claddagh Jewelry. Irish Jewelry. Sunflower Button Ring. Silver Button Ring. Sun Flower Ring. Adjustable Ring in Silver. Handmade Jewelry. Metal Flower Ring. Flower Button Ring. Silver Button Ring. Adjustable Ring. Silver RIng. Handmade Ring. Handmade Jewelry. Mediterranean Mandala Ring. Turquoise and Silver Mandala Ring. Button Ring. Adjustable Ring. Handmade Jewelry. The ring is lovely -- I especially enjoy pink flowers so this is special. It arrived safely and was well-packed to unsure that it would not be damaged. Thank you for being so quick in getting the ring in the mail to me! Pink Flower Bouquet Ring. Pink Flower Ring. Rhinestone Ring. Pink Ring. Silver Button Ring. Adjustable Ring. Handmade Jewelry. Octopus Ring. Octopus Button Ring. Silver Button Ring. Adjustable Ring. Silver RIng. Handmade Ring. Pewter Ring. Octopus Jewelry. Star Ring. Blue Ring. Blue Star Ring. Silver Filigree Ring. Adjustable Ring. Handmade Ring. Handmade Jewelry. Tree of Life Ring. Tree Ring. Pewter Ring. Adjustable Ring. Silver RIng. Handmade Ring. Pewter Button Ring. Handmade Jewelry. Gothic Ring. Button Ring. Black and Silver Ring. Goth Ring. Adjustable Ring. Black Ring. Handmade Ring. Goth Jewelry. Handmade Jewelry. Silver Button Ring in with Floral Medallion Face. Adjustable Ring. Handmade Jewelry. Mermaid Ring. Pewter Button Ring. Silver Button Ring. Adjustable Ring. Silver RIng. Handmade Ring. Pewter Ring. Mermaid Jewelry. Star Mandala Ring. Antiqued Silver Button Ring. Silver Star Ring. Adjustable Ring. Handmade Jewelry.